Nowadays, Mekong Delta plays an important role in the tourism development in Vietnam because of its attractive landscapes, various and unique culture. Mekong Delta Tours associate between canals, rice paddy fields are ideal destinations for all tourists who want to find the peaceful atmosphere and experience the simple life in the countryside. 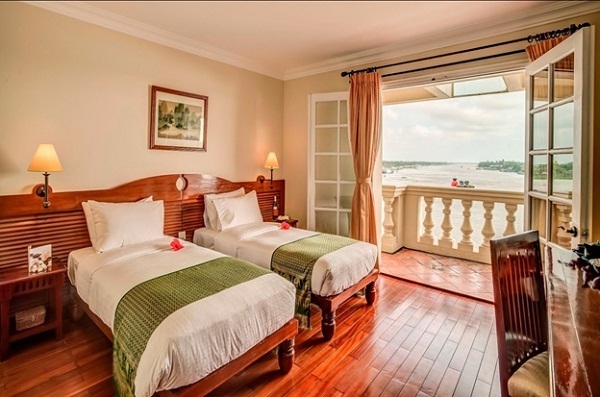 Besides searching attractive destinations in Mekong Delta, you should spend time on searching a hotel that is the best hotel to rest after a long sightseeing day. 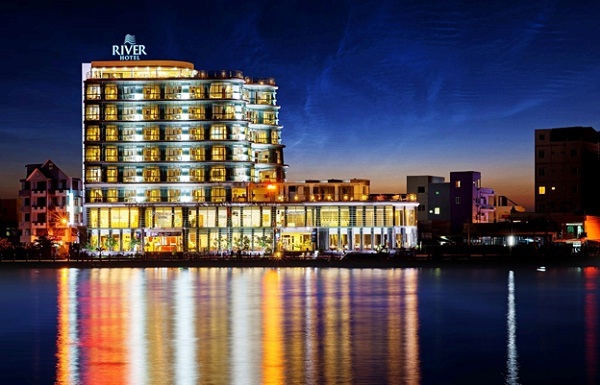 Overlooking To Chau River and Duong Dong Town, River Hotel features modern rooms offering panoramic windows with mountain or river views. Local attractions near River Hotel include Thach Dong Cave Pagoda (7 kilometers away) and Mui Nai Beach, which takes a 20-minute drive to reach. Xa Xia Border Gate is 15 kilometers from the hotel while Rach Gia Airport is approximately 2 hours drive away. Each air-conditioned and non-smoking room features a flat-screen satellite TV, safe and mini bar. The private bathroom includes a separate shower and bathtub. In additional, free Wi-Fi, an outdoor swimming pool and restaurant are available. The hotel’s restaurant also serves Western and Asia dishes. Guests can also order room service. Located in the Mekong Delta, Victoria Chau Doc Hotel is a 3-hour drive from Can Tho and less than a 5-hour drive from Phnom Penh. Ho Chi Minh City is 270 kilometers away, which takes approximately 7 hours by car. Transport services can be arranged by the hotel staff. All rooms and suites are comfortably furnished, beautifully decorated and offer river views. The hotel’s Victoria Spa is ideally located on the rooftop terrace and contains 5 massage beds with tranquil and beautiful views over the Bassac River. Moreover, there is an in-house Bassac Restaurant which serves Vietnamese and European cuisines. Centrally located in Can Tho City, the hotel is within 2 kilometers to Phat Hoc Pagoda, Binh Thuy Ancient House and Can Tho Train Station. Can Tho International Airport is just 4 kilometers away, while the famous Cai Rang Floating Market is a 30-minute cruise ride away. 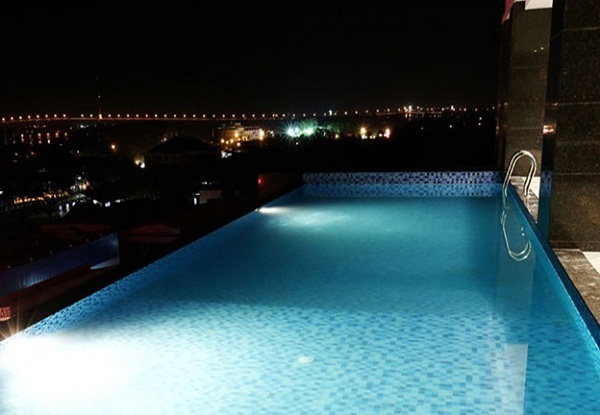 Newly opened in August 2013, Fortuneland Hotel boasts an outdoor pool, a hot tub, tennis court and a fitness centre. Operating a 24-hour front desk, it offers free WiFi access in the entire property and complimentary parking on site. Free rental of bicycles are also available. Offering views of the city, air-conditioned rooms feature an en suite bathroom equipped with a hairdryer, shower and free toiletries. Rooms come with a flat-screen cable TV, wardrobe, a mini bar and seating area. Hotel Fortuneland provides luggage storage, newspapers and usage of the business centre at no charge. Guests can approach the tour desk for car rental services and sightseeing arrangements, while laundry service and spa treatments are available at a surcharge. The in-house Fortune restaurant offers delectable Asian and Western dishes between 7 a.m to 10 p.m. Buffet breakfast is served daily and room service option is available. In Mekong Delta, there are many beautiful landscapes to enjoy such as floating markets, Unicorn Island, An Binh Island, Vinh Sang farm, bee farm, crocodile farm, raft village, Cham Tribal village, etc with the attractive folk games, which will bring satisfaction for you during trip. I am hopeful that you will find the best hotel in Mekong Delta.